It’d be easy to call Lycoming’s first game of the season a failure. On the surface, it wasn’t pretty. The Warriors scored just six points. The defense allowed more than 400 yards of offense. The special teams allowed two successful fake punts by Susquehanna, the first of which completely changed the complexion of the Warriors’ 7-6 loss. But dig a little deeper and it’s easy to see Saturday’s loss wasn’t all that bad. Was it frustrating? Absolutely. Mainly because there were so many missed opportunities for the offense to turn the game into a victory. But there’s room for optimism. The Lycoming defense passed the eye test. While they gave up 25 completions to Susquehanna starting quarterback Nick Crusco, they did it at a clip of only 5.76 yards per completion and 3.6 yards per attempt. And from a special teams standpoint, the Rivers Hawks didn’t return a single one of Connor Bell’s seven punts and Jamie Fisher connected on both his field goal opportunities. Clark touted the speed and athleticism of the defense prior to the start of the season, and the group lived up to that standard. Susquehanna goes to great lengths to spread the field wide with receivers. Often times, it meant Lycoming had to use linebackers to cover those receivers. But very rarely over the course of 60 minutes were the River Hawks able to get behind the Lycoming secondary. The Warriors did a tremendous job of keeping the play in front of them and an even better job of making the tackle at the point of contact. By the time the game was over, Susquehanna had filled up the stat sheet primarily in the running game, where it gouged the Warriors for 7 yard per run, including Montoursville graduate Cam Ott running for a game-high 129 yards. But it still had just seven points on the scoreboard. That was something the Warriors could hang their hat on. They stood their ground twice inside the 5-yard line in the second half to stop potential River Hawk touchdowns. And they made Susquehanna work for every inch they gained. “Giving up only seven points in a game, you’re going to win a lot of games doing that,” Smith said. And then there was the kicking game. The Warriors had a new starting kicker in Fisher, who last year primarily handled kickoff duties. Bell took over the punting job midway through last season. Both played Saturday like seasoned veterans. Fisher was true on field goals of 20 and 34 yards when the offense failed to cash in on chances for touchdowns. A year ago as a true freshman, Fisher was 1 for 2 on his field goal attempts. 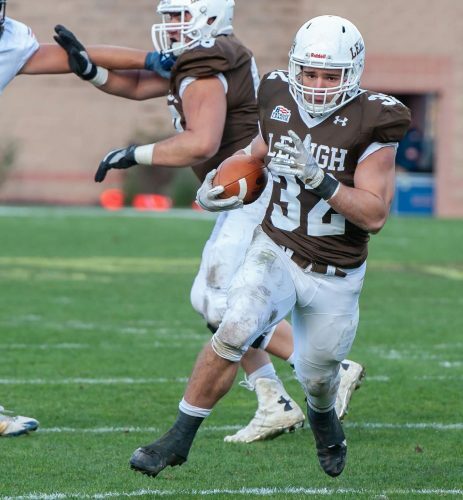 Of Bell’s seven punts, four were downed inside the Susquehanna 20-yard line and he averaged 34.9 yards per punt. But even more importantly is the River Hawks didn’t return any of his seven kicks. TIDE-TURNING PLAY: Susquehanna head coach Tom Perkovich had all the confidence in the world when he called a fake punt from his own 36-yard line in the second quarter of game Lycoming had complete control of to that point. And it worked perfectly. Ott’s 59-yard jaunt on the fake set up the only touchdown of the football game and was good enough to give the River Hawks a 7-6 win and the Stagg Hat Trophy. BEST DEFENSIVE STAND: A shanked punt set Susquehanna up in Lycoming territory midway through the fourth quarter and a completion to Tommy Bluj put the River Hawks in a goal-to-go situation. But that’s where the Warriors defense held. Adin Hines and D.J. Boyd had crucial tackles and on fourth down, Crusco’s pass fell incomplete in the end zone, helping Lycoming maintain its one-point deficit. BEST OFFENSIVE PLAY: As Lycoming controlled the game early, quarterback Chase Williams made a really strong decision on a third-and-11 play from the Susquehanna 31. He threw the ball high to 6-foot-5 receiver Nick Costello down the sideline and go make a play. Costello not only jumped over DB Daniel Shelton to make the catch, but then muscled out of a tackle to get to the 3-yard line. Lycoming had to settle for a field goal, but it was easily the best catch of the day. LOCAL ROUNDUP: Lycoming — Making his first defensive start, Hughesville graduate Trey Smith recorded seven tackles from his middle linebacker spot. He also recovered a blocked field goal and returned it 53 yards in the second half. Loyalsock graduate Caleb Robbins played outside linebacker, recording a pair of tackles, one solo. And Montoursville graduate Keith Batkowski picked up a special teams tackle. Susquehanna — Montoursville graduate Cam Ott, the River Hawks’ leading returning rusher, carried 14 times for 129 yards, including a 59-yard run on a crucial second-quarter fake punt which set up Susquehanna for its only score of the game. 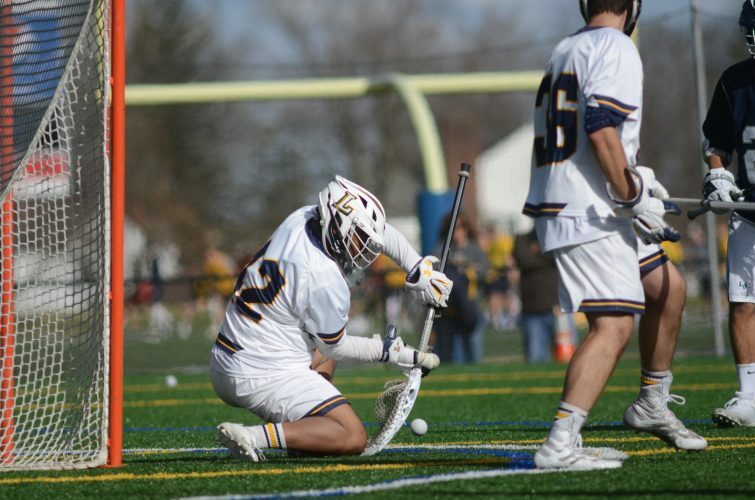 OFFENSIVE MVP: Nick Costello is still a matchup problem for defenses, as evidenced by his early catch to set up Lycoming in a goal-to-go scenario. He finished with five catches for 73 yards, leading the Warriors in both categories. DEFENSIVE MVP: It was thought coming into the season that D.J. Boyd’s presence would instantly make Lycoming’s an improved defense. The junior recorded 12 tackles (seven solo) in his return from injury, including 1 1/2 tackles for loss. UNSUNG HERO: Connor Bell did a tremendous job of pinning Susquehanna deep in its own end of the field for much of the second half. Four of his punts were down inside the 20, and all of his kicks were unreturnable. Mitch Rupert covers Lycoming football for the Sun-Gazette. He can be reached at 326-1551, ext. 3129, or by email at mrupert@sungazette.com. Follow him on Twitter at twitter.com/Mitch_Rupert.